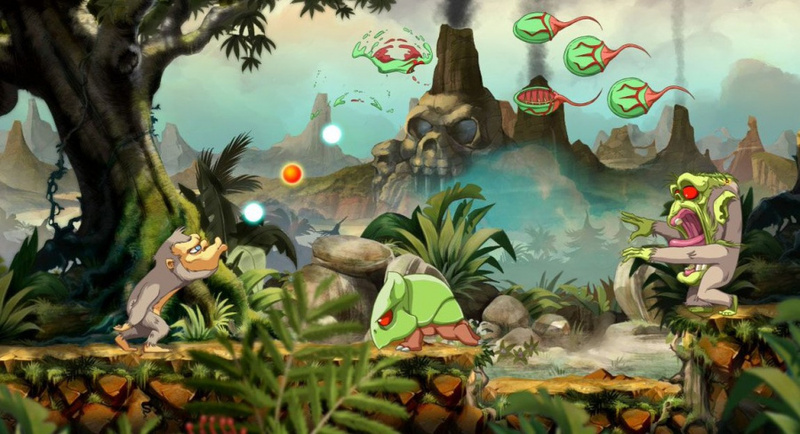 Jungle-based arcade shooter/platformer Toki - which saw hit arcades in 1989 before arriving on consoles such as SEGA Mega Drive in the years that followed - is getting a brand new remake. According to developer/publisher Microïds, the game is set to arrive by the end of 2018. Since it's almost 30 years since the original version launched, the remake is going to look a little different, but with original artist Philippe Dessoly leading art direction and veteran developer Pierre Adane lending a hand to development duties, it sounds like the new version of Toki will be more than faithful to the old one. I'll believe it when I see it, since I remember this remake getting announced close to 8 years ago. ... Spyro who? Juju all the way! I remember seeing this in the arcades back in the day. I’ll probably get this. YESSSSSS!! officially going APE RIGHT NOW! Is this the same as "Toki going ape spit"? I remember seeing a review of a genesis game called that. Wow. I remember seeing this remake project like... almost 9 years ago, by Golgoth Studio -or something like that. It was promised for Steam and Wii (same screenshots and key art, even!). And then... nothing came out of it at all. Until now, I guess. Let's see if this title finally sheds its vaporware status. Got me goin ape spit! This is one of the first games I remember seeing/playing as a kid. It was the arcade version and I was probably like 4. I might get this, I've explored my kid and early teens nostalgia enough, I need to try going even further back. As long as it's a remake of the Arcade game and not the awful Megadrive game, I'm interested. Ah, great memories. I played this game to bits on my trusty Amiga 500, which had the superior version, compared to the consoles of the time. Nice! I used to play the crap out of this game on the Lynx, and this looks pretty darn good! This was probably my favorite Atari lynx game. One of my biggest regrets was selling my Lynx and all of the games! I used to play Toki, Dirty Larry, Pit Fighter, etc. It was such an underrated handheld! Loved this game on the Amiga, I hope they also have the original on the game, maybe like Another World where you can swap to the original graphics. It better keep that awesome music! @BanjoPickles I have Lynx Version 1 & 2, I have pretty much all the carts released and I purchased some homemade carts made after the Lynx was no longer being made and supported. Right now they are packed away, and haven't been played for a number of years. I hate it when they replace pixel art with high-res vectors like this, like they did for the Street Fighter remake for Switch. The game loses most of it's charm. No thanks. I personally like the artwork here. Looking forward to this one. I played the bejesus out of this game on my Amiga. I remain vaguely hopeful! @AirElephant while I hear you, Dragon's Trap however was one example of this which converted me. Agreed, SFIIU was a bad example. I'll reserve reservation until nearer the time. Wow, I am familiar with a lot of arcade, computer, and console games - but somehow I don't remember Toki. But then there are probably a lot of games I overlooked. Wow, I remember playing this in my local 'arcade'... Which was actually a video (VHS) rental place with a small room off to the side with a few arcade cabinets. I remember playing it and some gits pulled my trousers down... and I just kept on playing lol. Played and enjoy it on my friends MegaDrive too. I'll have to keep an eye on this! Too bad this article just regurgitates what is from the twitter tweets. There is some good info on Toki arcade game and it's history. Wonder what happened to Golgoth Studio? I assume the developers took over to finish the game off from them? @ThanosReXXX great thanks for sharing that! I remember playing an arcade game at my local Godfather's Pizza where you played as a monkey with a football helmet and could never remember what it was called. This must be that game. I'm in. This was a good game on the Amiga back in the day. It was a good arcade conversion. Can't wait to check this out. 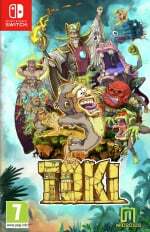 on a plus note i loved the original toki and i will 100% be getting this will this be the arcade version or TOKI : going ape spit from the megadrive? thats the version i used to play. I do have to say that I don't like that version at all. It looks more bland than the arcade and the Amiga version, and it also has a completely different level design, so as a fan of that original version, I would prefer the design to stay intact. But if you started with this game instead of the arcade version, then I can imagine you'd feel exactly the opposite. The original is before my time and strangely I have never heard of it. But this looks interesting. Don't like the visuals at all really. But the original was never really much of a looker either, although it did have decent parallax scrolling effects. Edit: Nah, I just watched the trailer and I don't like those visuals. @ThanosReXXX I definitely prefer the look in the main character and the colours in general in the Amiga version. @impurekind Yeah, me too. And considering its age, I'd say it's still holding up pretty well. It is kind of a fashion these days to turn all of these old classics into a kind of a living cartoon, so I'm not too surprised by the look of the remake. One of the few games that has nearly perfectly nailed that look, despite being 3D, is the latest Dragon Ball FighterZ game--it's one of the very few though. Most of the modern remakes of classic sprite games, however, just look like glorified Flash art for the most part, even that Wonder Boy remake for the large part doesn't look quite right to me. I'd love to see some more classic games brought back in that kind of proper authentic cartoon style. @GeminiSaint In ten years, this is going to be my comment on Pocket Rumble news. @ThanosReXXX Holy carp, I remember this game! I never played it myself but I remember it! If this actually comes out this is a day one get for me but I hope they do a Wonder Boy and let us swap visuals (those visuals, to be precise). This year is all about the end of the year apparently. @Dom I'm a bit confused about this "brand new" remake. It was announced in 2009, with a release due in 2011; those screenshots are more than 8 years old. There's even an old thread about it in the NL forums, posted in 2011 (that'll be one heck of a zombie revival if somebody bumps it). Apparently the original developer, Golgoth Studio, were struggling to secure a publisher; I wonder if Microïds' comments (regarding the artist/development) mean they are... A) remaking it again (unlikely), or B) pretending they haven't blown the dust off an almost-finished game sat in storage for nearly a decade. Having said that, I've wanted this since it was announced for the Wii so a Switch version is more than welcome. I just hope it's worth the wait. @impurekind "Most of the modern remakes of classic sprite games, however, just look like glorified Flash art for the most part"
Yeah, that's exactly the kind of vibe that I get from those efforts too, most of the time. I remember a top down/bullet hell shooter featured in an article on here from a while ago, that looked exactly like a flash-based game, and it made it feel empty to me. Those clips you posted are indeed good examples. Overall, I think it's fair to say though, that Western efforts are by far inferior to Asian ones. Almost everything that comes from that region has that polished anime vibe that a lot of people like. That Chrono Trigger footage even looks like it was made by the Dragon Ball Z animators; same kind of faces and expressions. The only effort from this side of the globe that I personally like, is Cuphead, because it's such a good representation of classic cartoons. It's so good, it's almost like you're back in time while playing it. I do also like the Ducktales remaster, though. I've always hated the Dragon's Lair and Space Ace games. They definitely look good, but the whole "one wrong move and you're dead" thing was really off-putting to me. I can't exactly put my finger on where it goes wrong with most of these 2D platformers. If you look at the video posted in comment #49, which transitions back and forth from the original arcade game into the new remake to show all the various stages, it is literally 1:1 where all assets are concerned, it only has a new coat of paint. And yet, pixel art somehow still seems superior. @ThanosReXXX Totally agree with everything you said there, especially the stuff about the like of Dragon's Lair and Space Ace basically having crap gameplay despite looking very cool, and also when you see the transition between the old and new game(s) how it/they almost almost lose something that was particularly appealing about the original pixel art in the move to HD--I think it's because the modern HD artists never seem to know how to draw sprite work like a proper comic-illustration/cartoon (and I mean with good lighting and shadow on each frame of the sprite too, not just flat or "detailed" but still kinda flat) rather than some "stylish" arty-farty look that only appeals to a very particular taste imo. There's a reason the whole comic-illustration/cartoon look has always been appealing to the masses, be it the classic eastern anime/Manga cartoons (Akira, Ninja Scroll, Wicked City, Ghost in the Shell, etc) or the western Disney (The Lion King, The Little Mermaid, Beauty and the Best, Hercules, etc) and Saturday morning stuff from the '80s-'90s (Thundercats, Dragon Ball Z, TMNT, Batman, Spider-Man, X-Men, He-Man, Gargoyles, etc), and I just wish more modern game developers would get a grasp on that. I want modern games that still looks that appealing visually--Capcom in particular had some frikin' amazing 2D pixel artists back in the day. It's a shame so many modern developers largely don't know what visually/aesthetically appealing 2D and 3D visuals should look like, as I see it. It's mostly all either "realistic", which I often just find dull and boring in most cases (and often very metallicky/plasticky looking in many games), or weirdly stylised. That intro animation from the new and definitely not improved Bomberman kinda made me think of those animated series such as Power Puff Girls, Dexter's Lab and Samurai Jack, although these were actually more substantial and entertaining to watch. Well, at least the latter two, for me. And agreed on the attraction of the comic look as well. I vividly remember when cell-shading first became a thing, that I was thinking to myself that now we were going to be able to play interactive cartoons and stuff, but the initial games that were made with the tech were far more crude than any animation of the time, and later on, cell-shading became kind of a style of its own, not necessarily wanting to match or look like cartoons/animation. Having said all that, I do have to admit that I actually do like how that first picture at the top of the page looks. Not much wrong with that, looks like a still from a quality cartoon to me, so somewhere along the way when they start to animate it, something gets lost in translation, even though you see in that comparison video I mentioned earlier, that there aren't any rigorous changes, so it must be a certain amount of subtleties that make the difference. At least, that's the only thing that I can come up with as a reason for why it just doesn't really click with me as much as the arcade original of Toki. @ThanosReXXX I think you misunderstood me. I meant if Toki actually comes out, I hope they let us swap visuals a la the Wonder Boy remake. @TheLobster Ah, okay. My bad. @ThanosReXXX Yeah, I think sometimes individual static images like the one at the top of the article can be a bit misleading: They can make certain games look better and other games look worse than they are. Once you see the games in motion you get a better idea of how everything comes together--and that's usually when it falls apart for me. And animation--that's usually an area where almost all of these modern 2D HD games just fail imo. Most of the time they are kinda terribly animated, with really weak key-frames (and very few frames in general)--I'm saying this as a trained animator--and that kind of stuff is much more noticeable in the HD era so it really stands out like a sore thumb. That's why games that actually go the extra mile, like Wario Land: Shake It! (not even HD but still animated great), Kirby's Epic Yarn (not cartoony or HD but still brilliantly animated 2D art), and Cuphead for example, where the 2D sprite animation has clearly been given a lot of love, shine.